If you are planning to attend a potluck anytime in the next few weeks, I have a salad you’ll love to make and take. It’s simple to assemble, feeds a crowd, and can be prepared several hours ahead. This is a big salad. It’s also a clean-out-the-leftovers kind of salad, meaning you can add leftover chopped turkey or ham to the mixture after your holiday dinners. If you don’t have the ingredients to make your own salad dressing to bind the greens, vegetables and cornbread, use a readymade creamy dressing, such as Green Goddess or Creamy Ranch. This will be one of your go-to recipes from now on, I promise. Layered salad serves a crowd and can be made ahead. Recipe is adapted from original by Corinne Cook in her cookbook, Extra! Extra! Read More About It! 1 recipe cornbread or 1 (8 ½-oz.) box cornbread mix, prepared according to package directions, cooled and crumbled or cut into small cubes. In a medium bowl, mix mayonnaise, sour cream, and dry ranch salad dressing mix. Set aside. 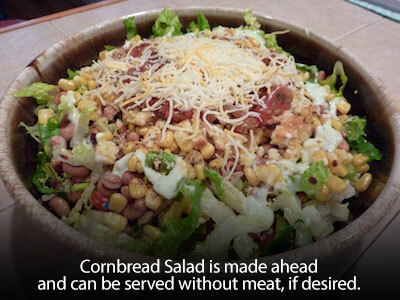 Layer in a large bowl, half of the cornbread, half of the beans, half of the corn, onions, tomatoes, and lettuce. Repeat layers. Seal top of salad with the dressing. Garnish with Cheddar cheese, green onions and crumbled bacon. Cover with plastic wrap and refrigerate several hours before serving. You have the option of tossing to make sure everyone tastes all the layers of ingredients or serving as is and letting guests dig in to find all the ingredients.